Here we provide you with significant dates of note for Fields of Remembrance. Please refer to the organisations and/or council in your regional or local area for specific details of the commemoration services that are planned. 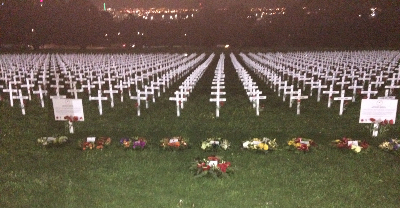 Field of White Crosses on display in the Auckland Domain. 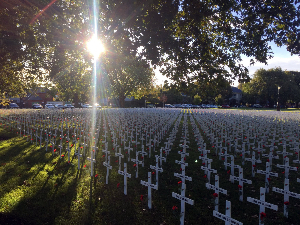 18,277 crosses are named for each New Zealander who died in World War I. The field was arranged by year with a separate 'Brothers Field' commemorating those families who lost more than one family member. A series of Light Boxes illustrated New Zealand's involvement in World War I. Written in 1916, this poem is dedicated to Vera Brittain's fiancé Roland Aubrey Leighton (1895-1915), killed at age 20 by a sniper. Her brother Edward Brittain was killed in 1918. Another highlight was the superb speech by Fabbiana Mazza-Carson, Fabiana is in her final year at Kings College. Over the past three years she has debated for Kings at the highest level. Memorial crosses honouring thousands of Christchurch’s fallen servicemen and women dominate Cranmer Square for the final time as part of the Fields of Remembrance project. The field contains more than 4300 named crosses commemorating Cantabrians who died in World War I.
Christchurch RSA is making their crosses available for families to collect - they simply ask that families let them know of the crosses that they have taken so that they can replace them in order to maintain a full set. 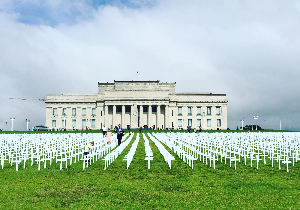 This field of 3,988 white memorial crosses remembers those from Otago and Southland who died one hundred years ago in the First World War. White Memorial Crosses will be available to descendants, and can be picked up from the field after the 11th November until the 23rd November. performing the daily ritual of playing Reveille & Last Post at the Armistice Field of Remembrance at Auckland Domain. This significant & solemn daily ritual will honour the service & sacrifice of 18,277 New Zealanders who gave their lives in service to our nation during World War One. It will also honour the families of those who served. The Fields of Remembrance Trust wishes to acknowledge Bill Rimmer’s generosity of spirit and his insistence this is not a duty but a privilege and he will not accept our offer of remuneration or reimbursement of expenses. Saturday, 20 October – Thursday, 15 November. Daily playing of Reveille (7.00am) and Last Post (8.00pm) by a lone bugler facing out over the field of crosses. Thursday, 15 November. Reveille played for the final time at 7.00am. Following that families will be invited to take home the crosses of family members from the Field. From the 18th schools & the public will also have this opportunity. At the eleventh hour of the eleventh day of the eleventh month in 1918 an Armistice was signed which ended the First World War. To commemorate the one hundred anniversary of Armistice Day the Trust is establishing a field of over 18,000 white crosses, each bearing the name of a man or woman who lost their life in the conflict. 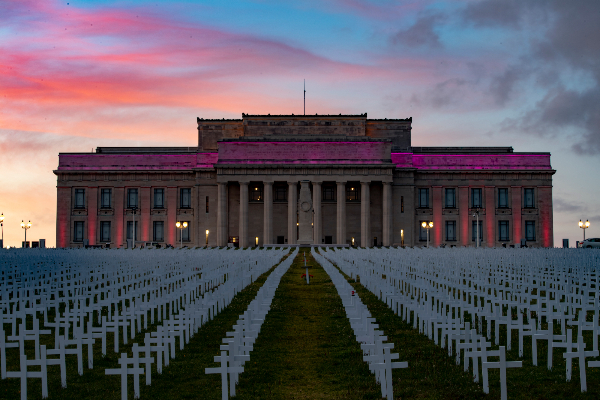 The crosses will be on display in the Auckland Domain. Proposed dates for the event are - 22nd October to 21st November 2018. 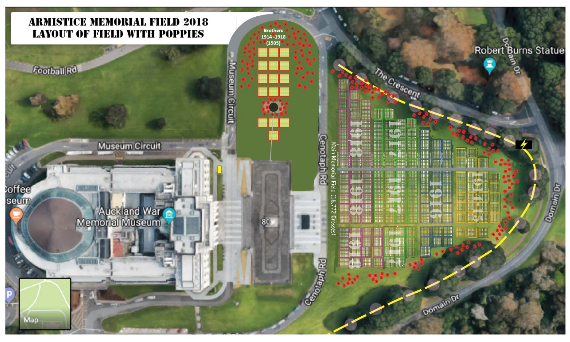 The Field will be positioned below the Court of Honour and Cenotaph in front of Auckland War Memorial Museum. The crosses will be laid out by year of death 1915, 1916, 1917, 1918 and those who died of illness or wounds up to 1921. Each cross will list the service number, rank, initials, surname and any honour/award won. A separate field will remember those families who lost more than one family member - nearly 700 mothers lost more than one son. This field will be positioned by the lone Gallipoli Pine and be surrounded by poppies. At the end of the commemorations crosses will be made available to families, and then to any community groups, schools, RSAs who may wish to collect them. 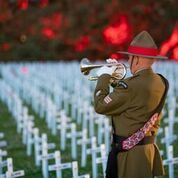 ANZAC Day commemorations will be taking place in communities across New Zealand, many will mark the occasion with a field of white crosses for their men who served in the First World War and subsequent conflicts. In the main centres the Field of Remembrance Trust has supplied named crosses for the men from their region who made the ultimate sacrifice. 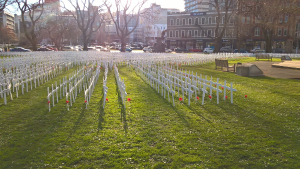 In the Auckland Domain just below the Cenotaph there will be a field of 4,799 white crosses. These will be on display until 2 May 2018. In the Botanic Gardens there will be a field of 5,270 white crosses. The crosses will be on display until Sunday 6 May. Crosses may be collected from the gardens by family and friends 10am - 4pm on Sunday 6 May. In Cranmer Square there will be a field of 4,398 white crosses. The crosses will be on display until one week after ANZAC Day. Some of the crosses commemorate those who died in the years immediately following the end of the War from wounds or illness contracted while on active service. Those of the Jewish faith are remembered with a Star of David. 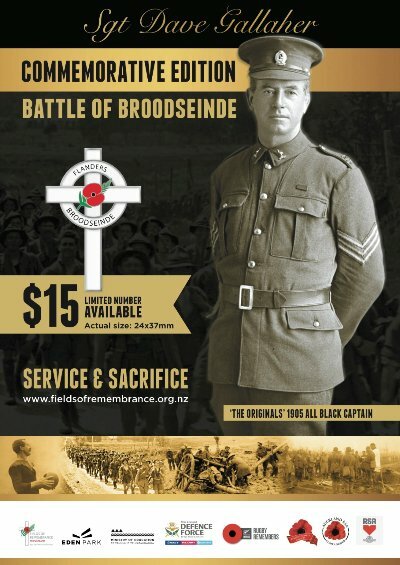 Note - DUNEDIN will not have any crosses on display this ANZAC but will have a field of 3,988 white crosses to commemorate Armistice Day, 11th November, and the end of the First World War. Wellington National War Memorial, Buckle St.
Passchendaele lapel pins are available for sale in ANZ Bank branches. This major battle was a prelude to the disastrous battle just 8 days later on the 12th October 1917. It was a highly successful attack but still the casualties were high especially for Auckland Battalions. One of those killed was Dave Gallaher, who captained the All Black Originals on their celebrated 1905-06 tour of Britain. The Trust together with Auckland RSA and Eden Park Trust will have a commemorative day of activities at Eden Park honour him and the 492 who died on this day 100 years ago. Dunedin RSA is laying a Field of Remembrance around the Cenotaph in the Queens Gardens opposite the museum from 1October to after Armistice Day 11 November. Toitū Otago Settlers Museum is staging the exhibition the Belgians Have Not Forgotten from the Memorial Museum 1917 at Zonnebeke. Timed to coincide with the centenary, Freddy Declerck will speak at its opening. His lecture is part of a four-lecture series over October, with two Belgian experts (Freddy and Charlotte Descamps) and two New Zealand experts (Professor Tom Brooking and Sean Broshanan) to discuss Passchendaele from different perspectives. The Women’s War: patriotism, service and dissent in Toitu's our temporary exhibition gallery. 10am - Passchendaele Field of Remembrance Service. Auckland Domain. 11am - Passchendaele Centennial Commemoration. Auckland War Memorial Museum, WWI Hall of Memories. There will be a national Sunset Ceremony at Pukeahu National War Memorial Park in Wellington on 12th October. Christchurch Memorial RSA is planning to hold a commemorative parade and service with wreath laying at the Bridge of Remembrance on 12th October. They will also be placing 3,200 Fields of Remembrance crosses in the Park of Remembrance on the bank of the Avon adjacent to the Bridge of Remembrance from 1st October until 30th November to cover the period of Passchendaele, the sinking of HMS Marquette and Armistice Day 2017.